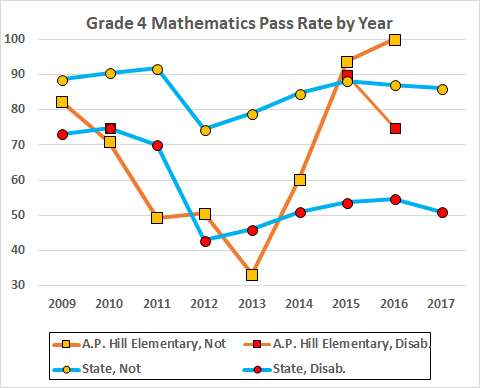 A cursory look at the SOL pass rates for A.P. 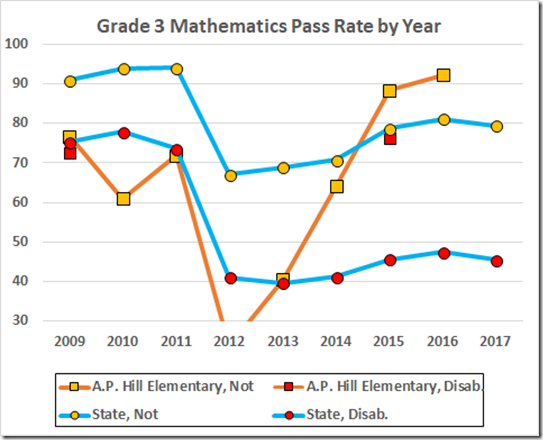 Hill raises the question why it took a “tip” to cause VDOE to investigate. 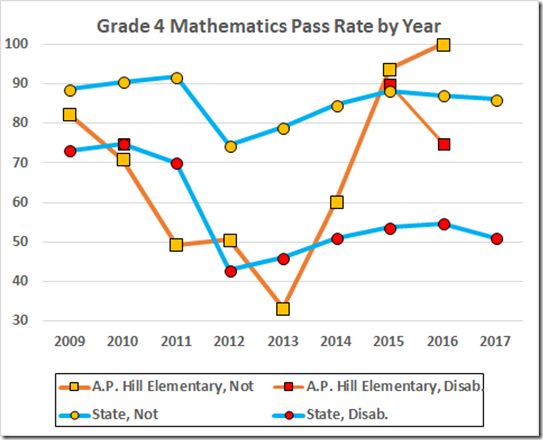 VDOE’s suppression rules hide all of Hill’s disabled pass rates but the one for 2015; that datum is well above the state average. 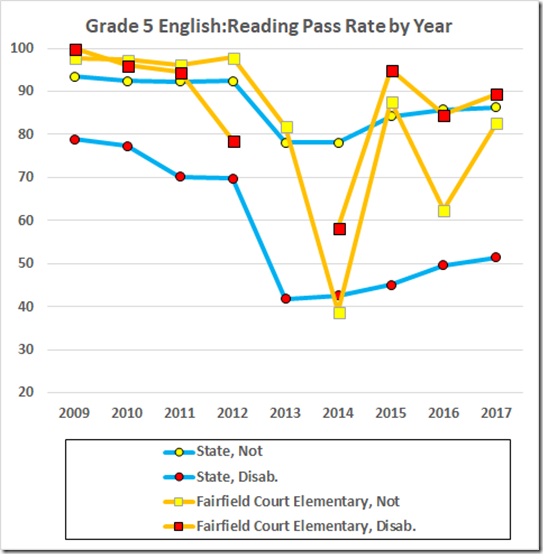 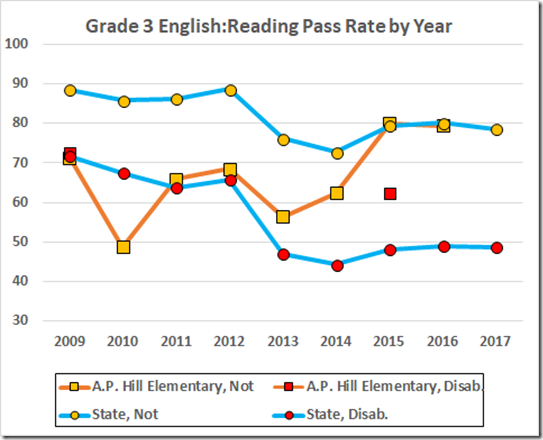 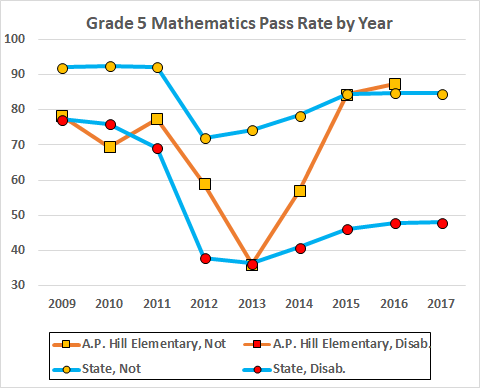 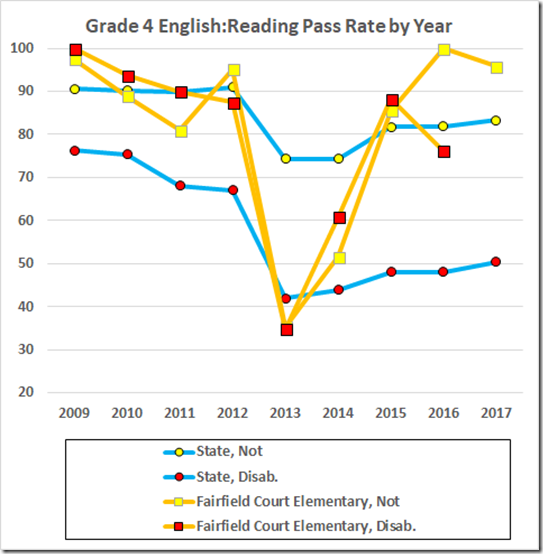 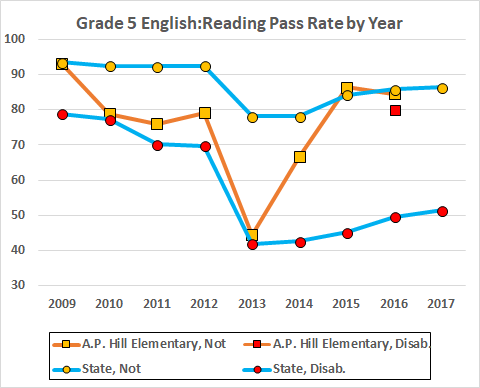 The non-disabled data tell the tale, however: Between 2013 and 2016, Hill went from a failing pass rate (the accreditation level for reading is 75) to matching the state average for two consecutive years. 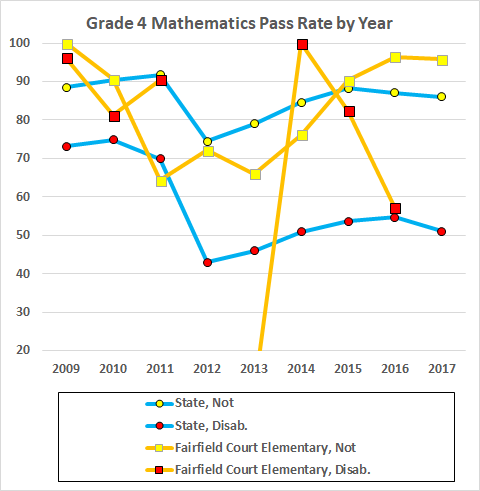 The fourth grade data are even more remarkable. 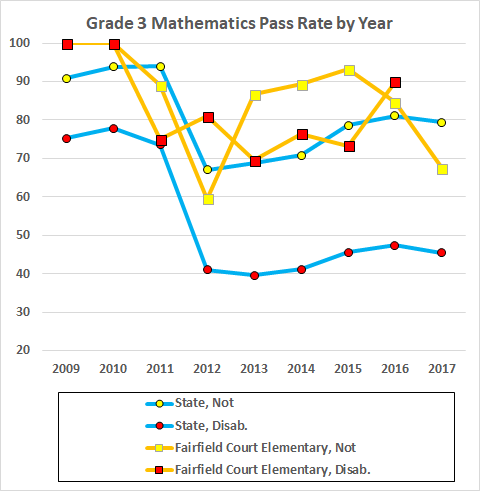 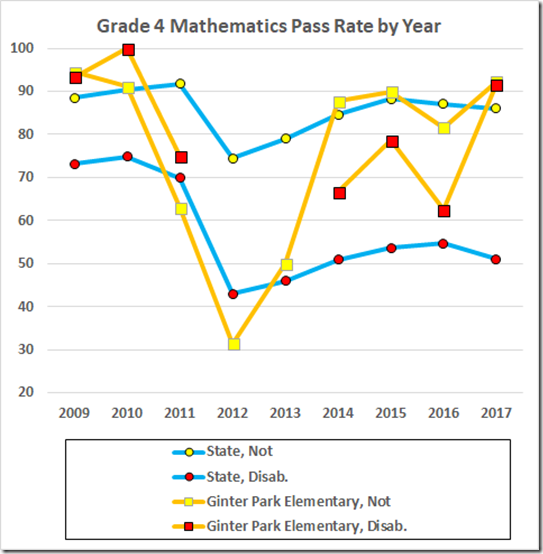 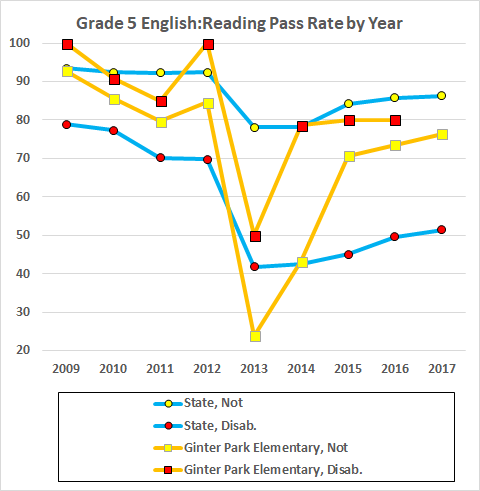 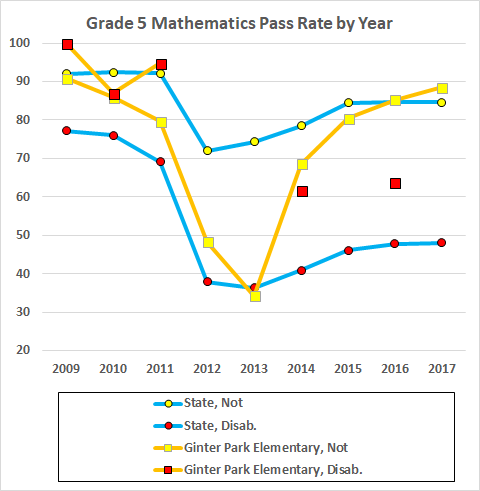 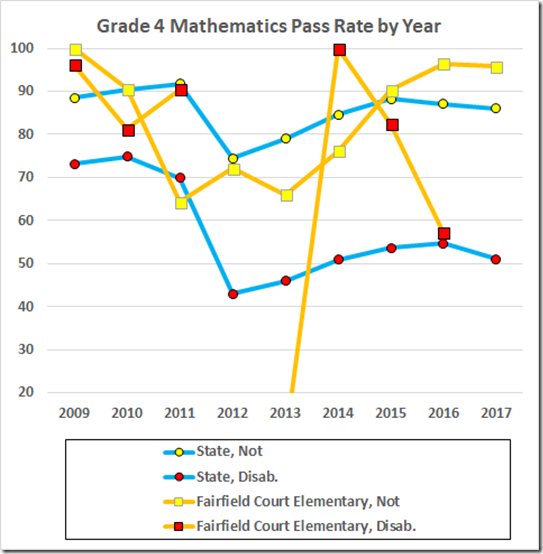 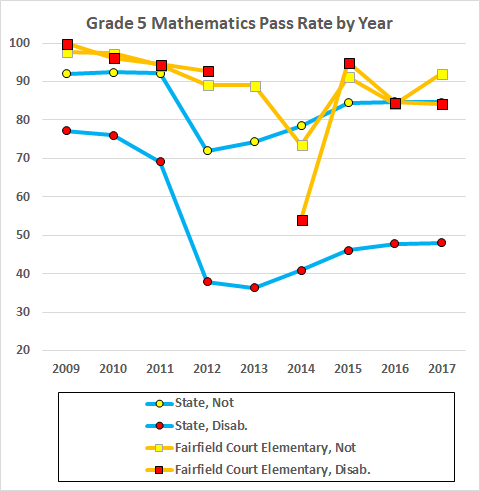 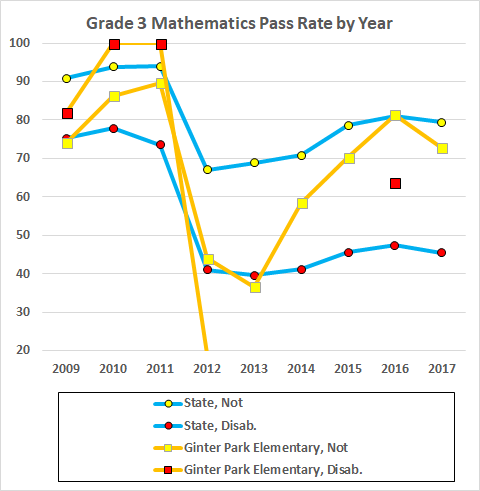 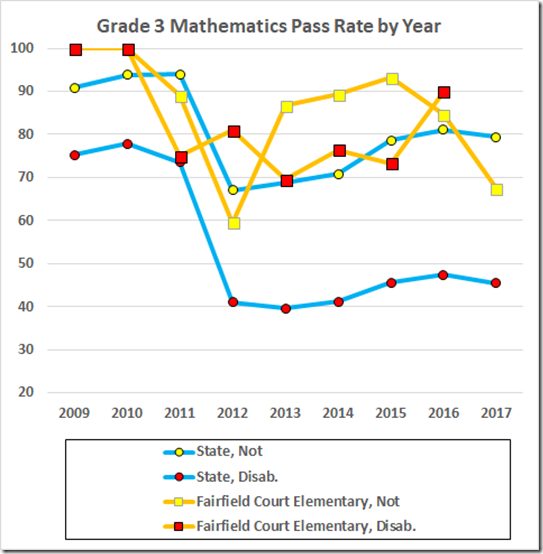 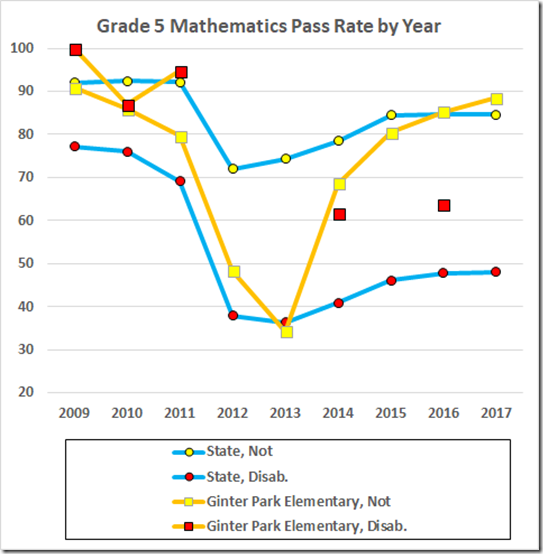 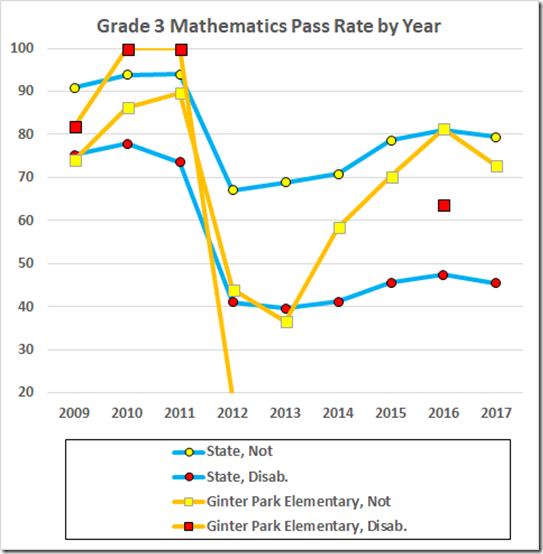 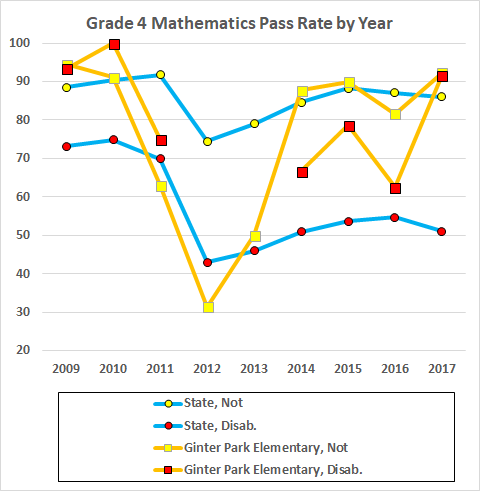 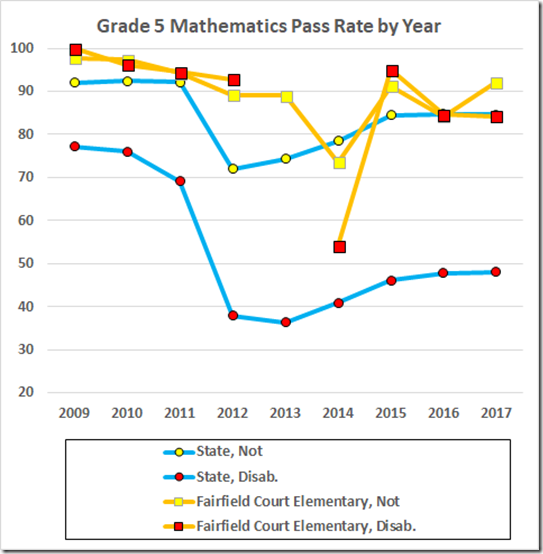 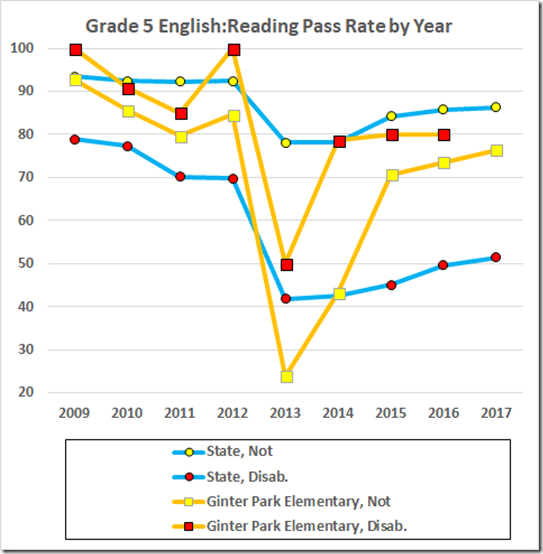 The fifth grade numbers show both another tremendous increase in the non-disabled rate and one extraordinary datum for the disabled students. 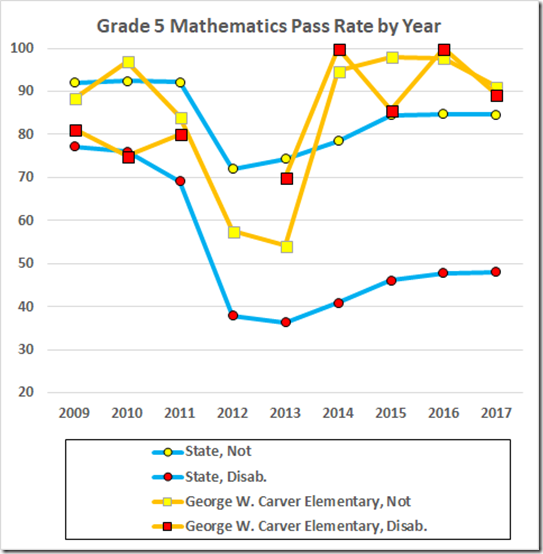 An alert Superintendent in Petersburg or a competent VDOE would have taken a hard look at that school in 2015. 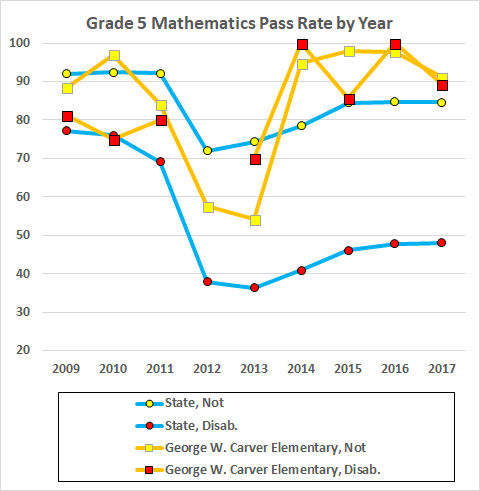 The Superintendent and/or VDOE were/was too happy with those unbelievable numbers to contemplate the obvious explanation. That off-scale 2012 disabled datum is a 19% pass rate. 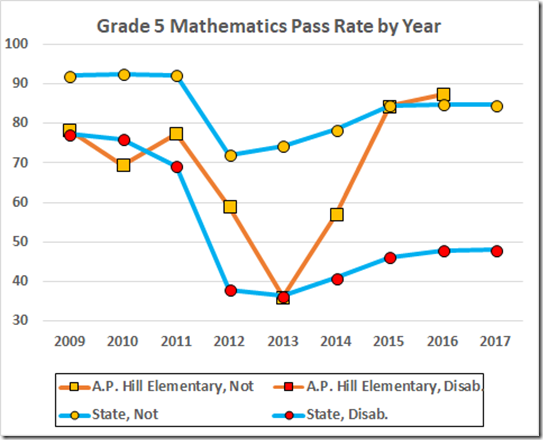 The plummet from the 100% pass rates reported in the previous two years is an example of what can happen when VDOE eliminates the test a school was using to cheat. 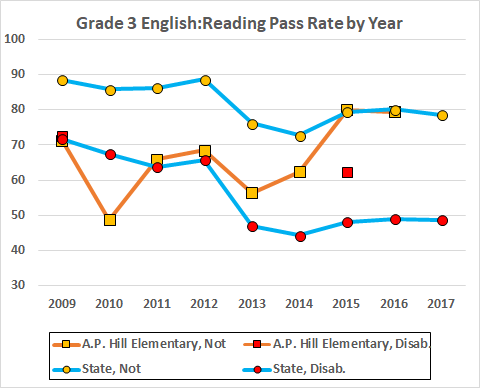 But, as you can see, the school found another way to improve the scores. 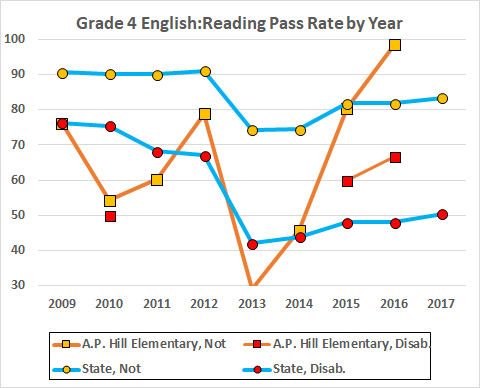 We’ll see whether our new Superintendent looks into the remarkable score increases at these and other schools. 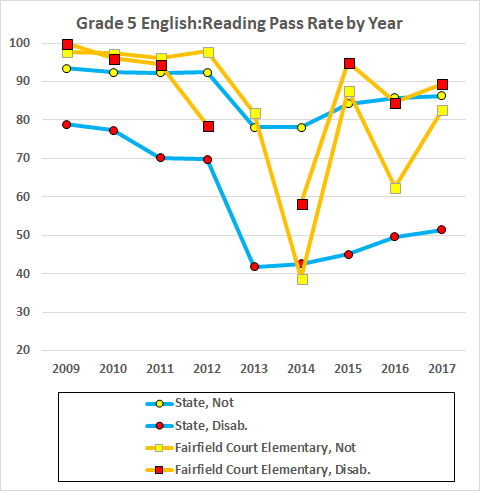 ASIDE: We learn from the RT-D that our Superintendent is concerned about the colors of graduation robes and hats. 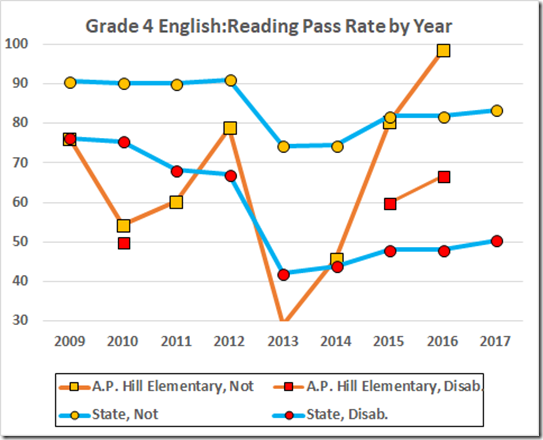 We can hope most fervently that the colors are a smokescreen to keep the press busy while he looks at the real, massive problems in Richmond’s public schools. 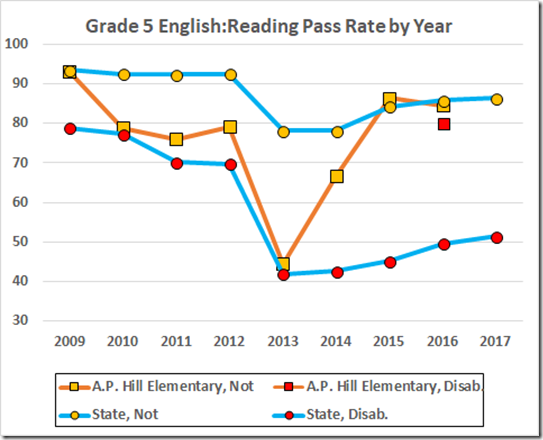 For sure, we’ll all attend our own funerals before VDOE undertakes a systematic look at this issue. 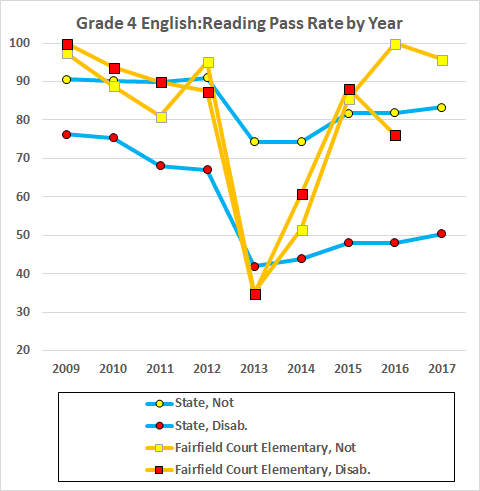 Does Elementary School Cheating Make the Middle Schools Look Worse?